It is the most iconic house in the United States, if not the world. It is home to leaders of the free world. The most famous address in America, 1600 Pennsylvania Avenue, is also the country’s most famous haunted house. Guests, staff members and even Presidents themselves have all reported hearing unexplained noises, feeling the presence of ghosts and even seeing unexplainable apparitions. The most frequently reported ghost sighting over the years at the White House has been the ghost of one of the most popular presidents of all time, the acclaimed 16th president, Abraham Lincoln, whose life was tragically cut short by a bullet from an assassin’s gun on April 15, 1865. The first person to reportedly see Lincoln’s ghost was First Lady Grace Coolidge, wife of President Calvin Coolidge (1923-1929). According to her, the very tall and lanky former president was standing in the Oval Office looking out the window, across the Potomac to the former Civil War battlefields beyond. First Lady, Lady Bird Johnson, wife of President Lyndon Johnson (1963-1969, reportedly felt Lincoln’s presence one night while watching a television program about his death. However, the most notable sightings of Abraham Lincoln’s ghost were during the long presidency of Franklin D. Roosevelt (1933-1945). This was most likely because President Roosevelt also presided over the country during a time of great turmoil and a brutal war. First Lady Eleanor Roosevelt used the Lincoln Bedroom as her study, and claimed she would feel his presence when she worked there late at night. During her visit to the White House, Queen Wilhelmina of the Netherlands heard a knock on her bedroom door in the night. When she opened the door, she reportedly saw Lincoln’s ghost , wearing his familiar top hat, and she fainted dead away at the sight. 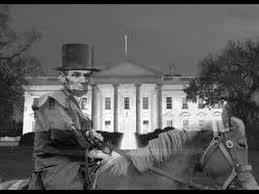 One of the most notable sightings of Lincoln’s ghost came from British Prime Minister Winston Churchill on one of his visits to the White House during World War II. Churchill loved to retire late, take a long hot bath while drinking a Scotch and smoking a cigar to relax. On this occasion, he climbed out of the bath naked, except for his cigar and walked into the adjoining bedroom. He was startled to see Lincoln leaning on the mantle of the fireplace in the room. Several psychics believe that Lincoln’s spirit remains in the White House to be on hand in times of crisis and to also complete the difficult work that his untimely death left unfinished. Whatever the reason for Lincoln residency at the White House, one thing is for sure, his is a much more welcome spirit than the others that roam the earth.